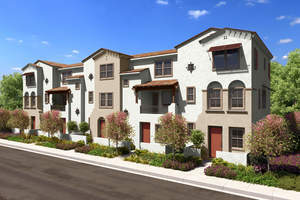 UPLAND, CA--(Marketwired - Oct 30, 2015) - William Lyon Homes' brand-new Citrus Court and Citrus Pointe neighborhoods at The Orchards in downtown Upland are introducing the rewards of homeownership to renters that are tired of investing in their landlord's future. Those ready to reinvigorate their lives as first-time homebuyers are finding both collections offer everything they need for a well-rounded lifestyle. Offering brand-new attached homes, private recreational amenities, the financial benefit of no Mello Roos fees and a prime Upland location near freeways, leisure and entertainment, The Orchards is an amazing opportunity buyers can't afford to miss. Investing in a home at The Orchards also offers valuable assets inaccessible to renters, such as building equity, enjoying tax benefits, taking advantage of current low interest rate opportunities, and having the peace of mind of all new home construction backed by William Lyon Homes' extended three-year Warranty & Service Program. To learn more about purchasing one of Citrus Court's desirable attached designs or a modern townhome design at Citrus Pointe, visit the Sales Gallery today and inquire about FHA financing options. For details on each neighborhood, visit www.LyonCitrusCourt.com or www.LyonCitrusPointe.com. For details on The Orchards' coveted lifestyle, log on to www.LyonTheOrchards.com. "Today's renters are continuing to realize why owning is better than leasing, and the valuable options available at The Orchards makes their decision to transition to homeownership irresistible," said Ben Blomdahl, Director of Sales for William Lyon Homes. "If you're eager to refresh your future, we encourage you to take your first step towards homeownership and visit The Orchards today." With prices starting from the $330,000s, Citrus Court's four distinctive attached-home designs suit a range of lifestyle needs with well-planned interiors ranging from approximately 923 to 1,723 square feet, with two to three bedrooms, two to three baths and two-car garages. Citrus Pointe's beautiful two- and three-story townhomes are available in five well-appointed designs with prices starting from the $345,000s. The spacious interiors span from approximately 1,177 to 1,583 square feet, with two to three bedrooms, two full and two half baths, two-car attached garages, and dens and lofts in select plans. Distant views of the Mount Baldy and the San Gabriel Mountains are available from select locations in both neighborhoods. Enriching The Orchards' lifestyle are exclusive recreational amenities that include a swimming pool and spa; barbecues for outdoor gatherings; a tot-lot; and a private recreation center. Pocket parks and greenbelts will also be scattered throughout the community. The commuter-friendly downtown Upland location puts the Metrolink station within walking distance for easy rides to Los Angeles-area employment and attractions, while I-210 and I-10 are both nearby, easing the burden of driving commutes. For air travelers, the Ontario International Airport is also within close proximity. Abundant sports and leisure opportunities are convenient to the community with golf at Red Hill Country Club & Golf Course and Upland Hills Country Club, baseball fields across the street at Olivedale Park, and challenging indoor climbing workouts at Hangar 18 Climbing Gym. Residents seeking culture, dining and shopping attractions can be in historic downtown Upland in minutes to enjoy charming boutiques, antique stores, restaurants and live theater. In neighboring Ontario, bargain shoppers have Ontario Mills retail outlet at their disposal, while the renowned Victoria Gardens retail center in nearby Rancho Cucamonga features Macys, AMC Theatres, Wells Fargo Bank, Fleming's Prime Steakhouse, The Cheesecake Factory and a number of other shops and dining spots. Vons and Trader Joe's grocery stores are also within close proximity to the community. To visit Citrus Court and Citrus Pointe at The Orchards, travel west on I-10, exit Euclid Ave., turn left, then turn right on Euclid Ave., right on 8th St. and follow the signs. From I-210, exit North Campus Ave. and travel south. Turn right on E. 16th St., left on Euclid Ave., then left again on E. 8th St. and follow the signs. Located on the corner of 8th St. and Sultana Ave., The Orchards' Sales Gallery is open daily from 10 a.m. to 5 p.m.
For more information, please call 909.946.0900. It matters who your builder is and William Lyon Homes is a company built upon a legacy of pride and integrity. A team of visionaries who are passionate about homebuilding and committed to providing a high quality homebuying and homeownership experience, William Lyon Homes has earned a solid track record for outstanding construction and customer service since 1956. The company continues to expand its well-respected brand beyond California, Arizona and Nevada and into other market areas across the Western region with the acquisition of Polygon Northwest Homes, its newest division in Washington and Oregon, and its Village Homes division in Colorado. William Lyon Homes' shares are publicly traded on NYSE under the symbol WLH. 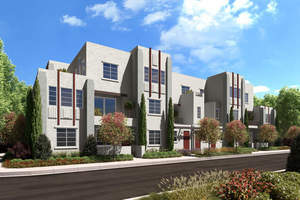 For updated information and to learn more, visit www.lyonhomes.com. Prices are effective as of the date of publication. Pricing is approximate and is subject to change without prior notice. CalBRE Officer License: 00982816. Citrus Court at The Orchards. Citrus Pointe at The Orchards.